Our Abpromise guarantee covers the use of ab55328 in the following tested applications. WB Use at an assay dependent concentration. Predicted molecular weight: 88 kDa. 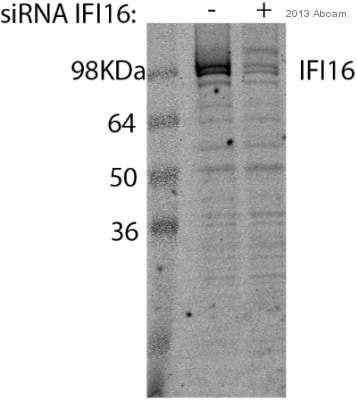 Interferon (IFN) Inducible 16 (IFI16) protein belongs to a family of HIN 200 human and mouse proteins. IFI16 is a nuclear protein comtaining regulatory domains such as DNA binding domain, transcriptional regulatory domain and DAPIN/PAAD domain. IFI16 has three isotypes A, B, and C (85-95 kDa), which arise as a result of mRNA alternative splicing. All are phosphorylated on serine and threonine residues and can homo and heterodimerize. Expression is restricted to the nuclei of hematopoietic cells, fibroblasts and epithelial cells. IFI16 expression in hematopoietic cells of myeloid lineage is tightly regulated and highly induced in the differentiation and proliferation of the cell. Due to its localization in the nucleus, regulation of protein expression, and ability to bind DNA, it is assumed that IFI16 has a role in transcription regulation of cell differentiation. In addition, it was found that IFI16 can act as a transcriptional repressor and is involved in regulation and activation of p53 in cancer cells. Nucleus. Cytoplasm. Note: Cellular distribution is dependent on the acetylation status of the multipartite nuclear localization signal (NLS); NLS acetylation promotes cytoplasmic localization. ab55328 staining IFI16 (green) in Human Saos2 cells by ICC/IF (Immunocytochemistry/immunofluorescence). Cells were fixed with formaldehyde, permeabilized with 0.2% Triton X-100 and blocked with 5% normal goat serum for 30 minutes at 20°C. Samples were incubated with primary antibody (1/200 in 5% normal goat serum in PBS) for 1 hour at 20°C. An Alexa Fluor® 555-conjugated Goat anti-mouse IgG polyclonal (1/1000) was used as the secondary antibody. DAPI - blue. IFI16 antibody (ab55328) used in immunohistochemistry at 3ug/ml on formalin fixed and paraffin embedded human tonsil. 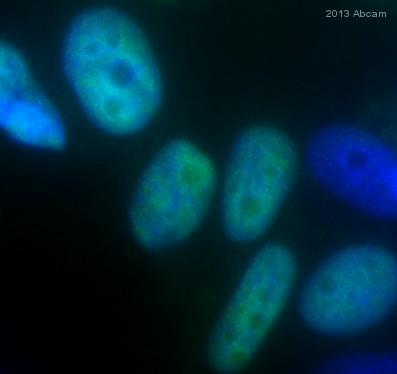 IFI16 antibody (ab55328) at 1μg/lane + HeLa cell lysate at 25μg/lane. Overlay histogram showing Jurkat cells stained with ab55328 (red line). The cells were fixed with 80% methanol (5 min) and then permeabilized with 0.1% PBS-Tween for 20 min. The cells were then incubated in 1x PBS / 10% normal goat serum / 0.3M glycine to block non-specific protein-protein interactions followed by the antibody (ab55328, 1µg/1x106 cells) for 30 min at 22ºC. The secondary antibody used was DyLight® 488 goat anti-mouse IgG (H+L) (ab96879) at 1/500 dilution for 30 min at 22ºC. Isotype control antibody (black line) was mouse IgG2b [PLPV219] (ab91366, 2µg/1x106 cells) used under the same conditions. Acquisition of >5,000 events was performed. 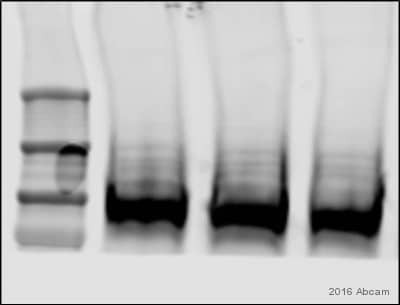 This antibody gave a positive signal in Jurkat cells fixed with 4% paraformaldehyde (10 min)/permeabilized with 0.1% PBS-Tween for 20 min used under the same conditions. Publishing research using ab55328? Please let us know so that we can cite the reference in this datasheet.